Savvy travelers often recommend carrying your wallet in a front pocket to thwart would-be pickpockets. 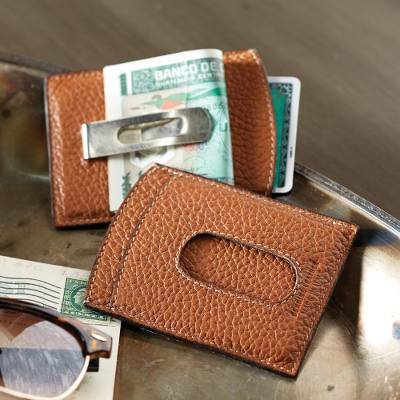 This compact money clip condenses up to 30 bills and five credit cards into one slim leather wallet. The clip and card holder is made in a family-run studio in Florence, Italy, of Italian pebbled leather. You can find leather money clip 'Savvy Traveler' by National Geographic in accessories categories such as Nat Geo Other Accessories, Nat Geo Gifts Other Accessories, Nat Geo Sale Other Accessories and Leather Other Accessories. Enjoy exploring these sections for other Novica treasures. For what this is designed to do this is a very good product. But 30 bills is, in my mind, a gross exaggeration. At most I don't like to carry more than about 10. Remember that 10 when folded becomes 20 in thickness. I don't see this holding 30 but if so it will certainly not be "compact" if that is what you want to do. There is no magic in this simple design. In mine I typically carry: One pocket holds my drivers license and medical information; one pocket holds the equivalent of four credit cards; and the clip holds a $50, 2 $20's, 2 $10's, 2 $5's, and 3 $1's (total 10 bills $123) and I am good to go. I have been carrying my wallet in my front pocket for thirty plus years and have yet to find the "perfect" wallet but this comes as close as I have gotten. However, (a) membership cards and (b) receipts now end up in my pocket and not in this minimalist wallet. For now, that is my preference but with reduced capacity goes less convenience. I prefer not to carry a "purse" that is seemingly more convenient.